The one thing I dislike more than anything else (almost) is when you pin something on Pinterest only to find that when you click on the link, it takes you to the home page of the website and you are then forced through the rigorous/arduous task of scrolling down each and every page and looking through the posts archive of the blog JUST to find the dumb link that you were SUPPOSED to be linked to in the first place! 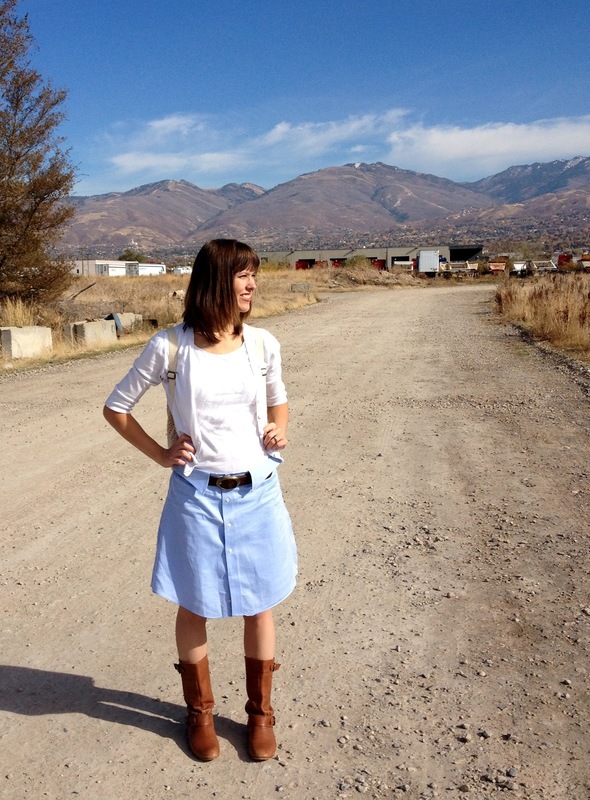 For instance, my friend pinned this tutorial for a skirt made out of an old men's shirt. 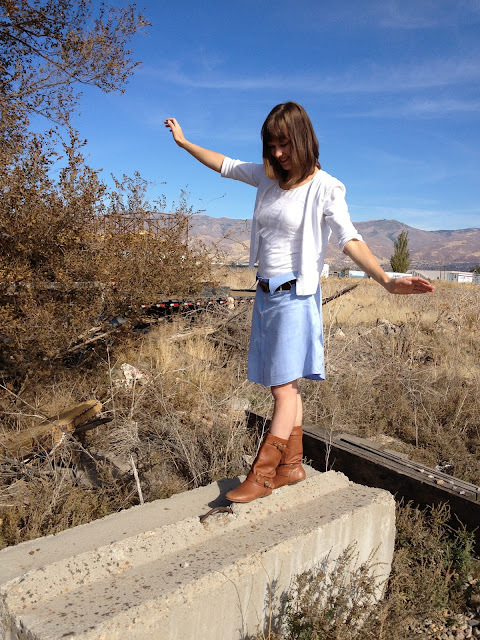 I was super excited to give it a try but didn't get around to it until last week when I realized that I only have two or three Sunday outfits to wear. One of the curses that comes with breastfeeding I suppose! Anyway, I was really annoyed so after looking through the entire blog for about 25 pages (somewhere around there), I gave up and decided to figure it out on my own! So I did, and here's what I came up with! 1. Get a men's shirt. 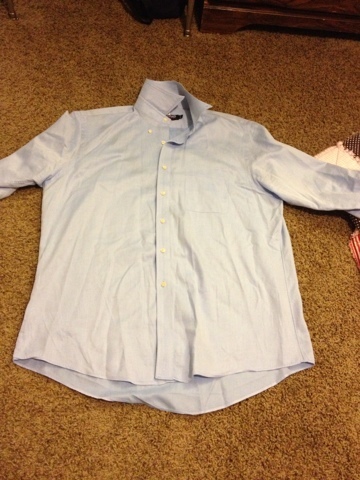 I used the Kirkland brand, size L.
2. Leaving about 1/4-1/2 inch, cut off the neck... thing. Can't remember what it's called right now. 3. Also cut the arms off just below the armpits. Try to cut as straight as possible. I ended up having to cut just above my fourth button. 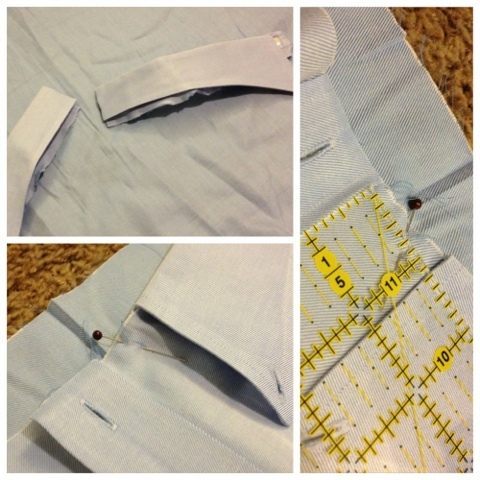 Make sure to leave plenty of room above the button so that when you hem, you'll still have the button at the top! 4. 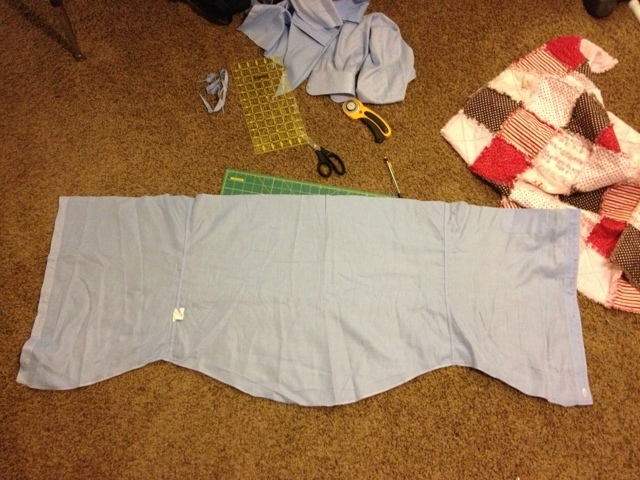 Lastly, cut straight across so now you only have the bottom half of the shirt. 5. 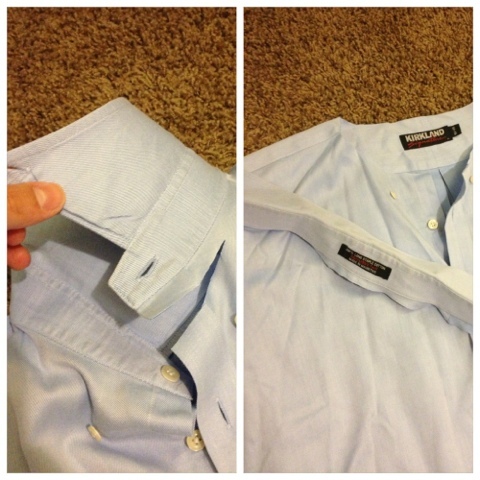 Button up your shirt, turn it inside-out, and lay it flat on the ground. 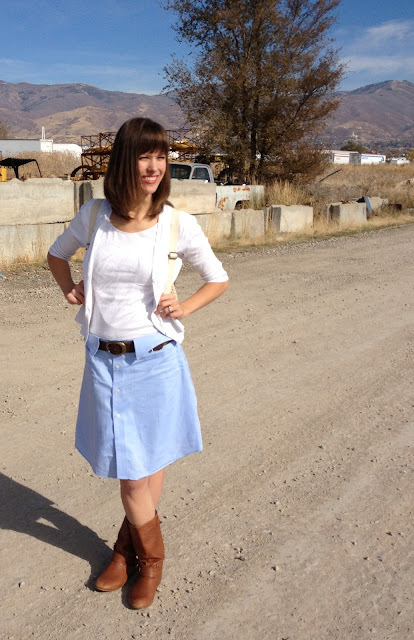 If you want more of a pencil shape, then draw a line down the side of your skirt that flares out slightly. I wanted my skirt to flare out more, so I tried the shirt on, pinched the sides to figure out how much it needed to be taken in, then drew a line from the pinch mark to the corner of the side. Stitch along your line. 6. When you cut the excess material, make sure you leave at least a half an inch. The less you cut, the easier this is. 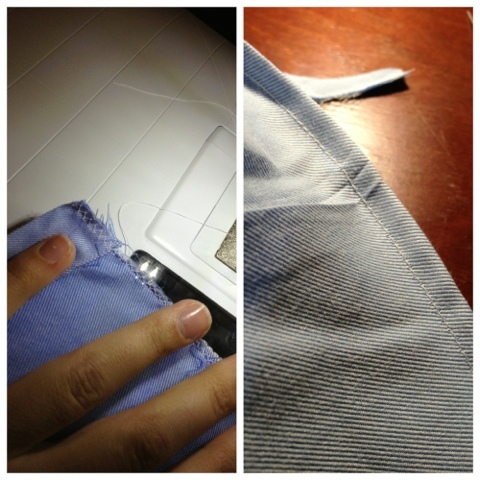 Now you're basically hemming your excess material next to the seam. 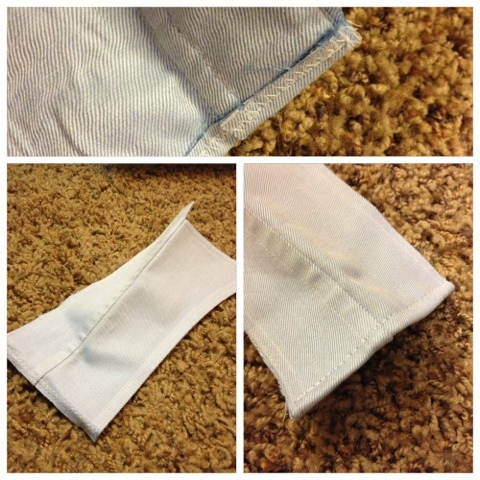 Fold it over once, then once again and sew it down. It should look like this on the outside when you're done. 7. 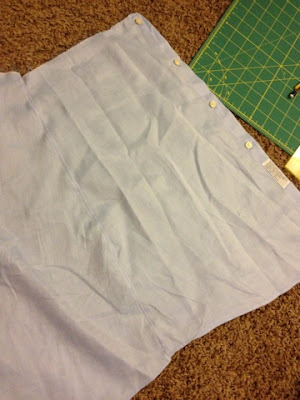 Next, zig-zag stitch around the waist then hem, or just hem around the entire top part of the skirt. Hem around the bottom of the skirt shirt, too. 8. Now it's time for the neck yoke, thing... I'll remember what it's called eventually! 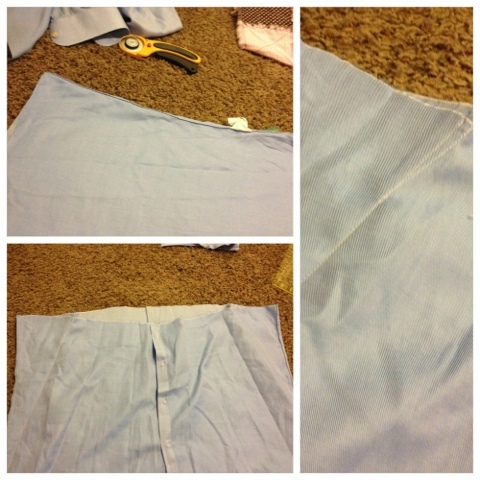 Cut it in half, place it on your skirt in the position you want it, then cut it to be in line with the side seams of the skirt/shirt (pluse 1" for seam allowance). 9. 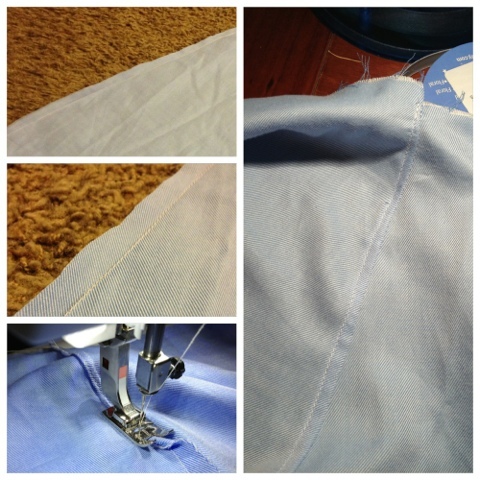 Zig-zag stitch the side that you cut, then hem it. 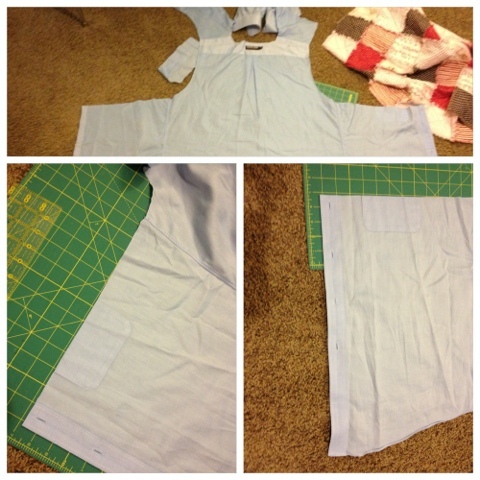 This might be a little hard because it's thick, but your sewing machine should be able to handle it! 10. Almost there! Line up the neck (maybe that's just what it's called?) 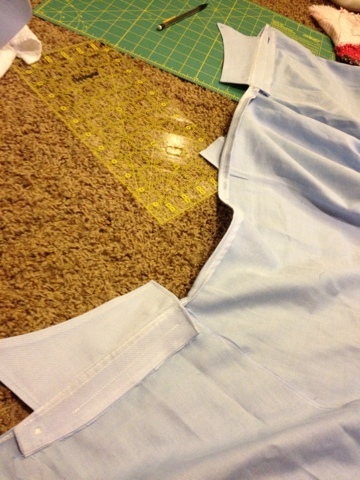 with the side seams and pin it flat down that that it comes out with the front of the neck... well... on the front. 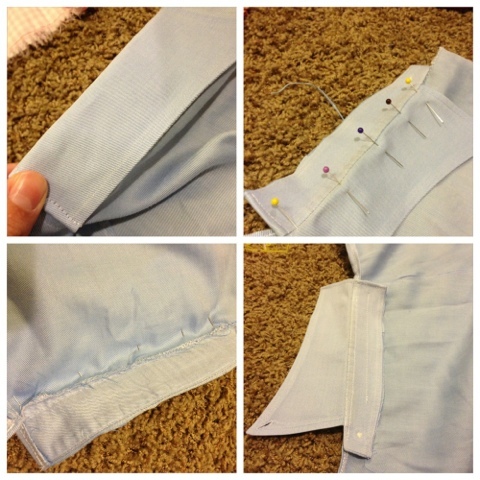 Do a straight stitch on the back side (not the side that shows) to keep it in place. I LOVE my backpack! I use it as my diaper bag. Just fyi. Also, keep on the lookout for a tutorial on my embellished shirt! You'll never guess where I got my inspiration! Have a great week! Way cute skirt! And CUTE boots too! Can't wait to see you next week!!! THERE we go! Thank you SO much, Karissa! Totally had one of those moments! Agreed! Next weeks reunion will be sweet! Oh my goodness! I die at the cuteness! 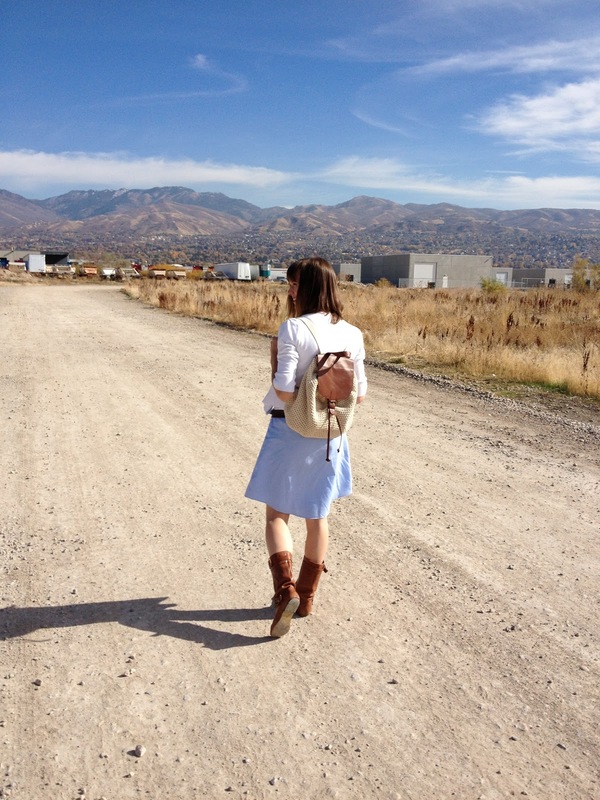 Plus your outfit photos are presh! Who takes them? 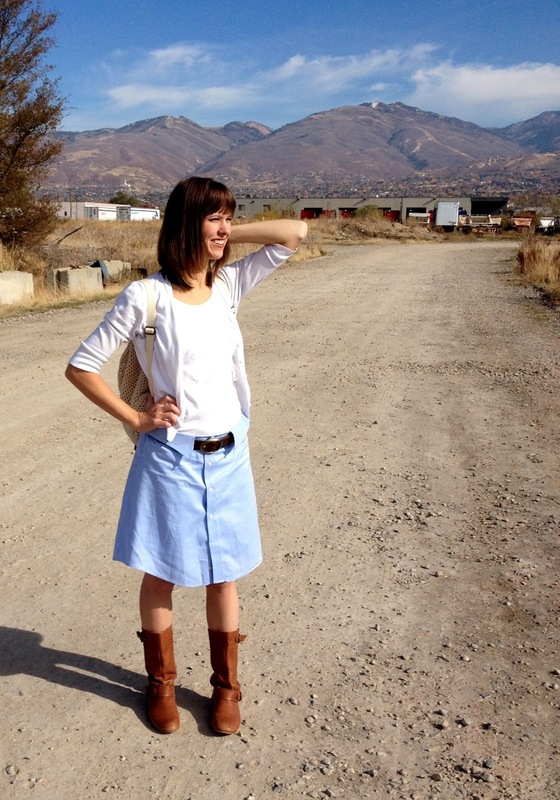 Good job on your skirt. Thanks so much, Jana! I've got this fandidily-tastic friend who lives very close to home (like, upstairs in my home) who runs a blog and we swap photography services. Check her out at Tiffany Imposter. She's in my sponsor sidebar. Thank you, thank you Kara and Erica!